DENVER (AP) Nikola Jokic was looking for his teammates instead of his shot, and it worked out well for the Denver Nuggets. 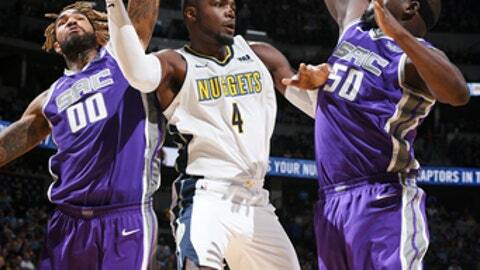 Paul Millsap had 18 points and nine rebounds in his first home game with Denver, Gary Harris scored 17 and the Nuggets used a strong defensive effort to beat the Sacramento Kings 96-79 on Saturday night. Kenneth Faried had 18 points and eight rebounds and Will Barton scored 15 points to help Denver win its home opener. Denver recovered from losing a fourth-quarter lead in Utah on Wednesday to get its first win of the season. Rookie De’Aaron Fox led the Kings with 18 points off the bench and was one of their few highlights. Sacramento struggled from the field was outrebounded 58-39. Willie Cauley-Stein led the Kings with nine rebounds but scored just two points on 1-for-5 shooting. Sacramento shot 36.5 percent from the field. The Kings couldn’t take advantage of a rough offensive night from Denver Jokic, who missed all three of his shots and failed to score. He finished with nine rebounds and seven assists. Jokic scored seven points against the Jazz, but coach Michael Malone isn’t worried. The Nuggets missed their first eight 3-pointers and were 3 of 15 from long range in the first half but found their stroke in the third. Harris hit one as part of a 7-0 run and Barton drained two as Denver built a 16-point lead. The lead grew to 21 in the fourth. Kings: F Bogdan Bogdanovic missed his third straight game with a right ankle sprain. … The Kings shot 32.5 percent in the first half and had just 27 points late in the second period. Nuggets: Denver was 0-13 last season when scoring fewer than 100 points. … F Richard Jefferson was not active. Jefferson signed a free-agent contract with Denver on Thursday after the team waived veteran guard Jameer Nelson. … Chandler led Denver with 12 rebounds. The Nuggets are marking their 50th year of basketball and started with a salute to six of the greats in team history. Former coach Doug Moe, whose 432 wins is most in franchise history, was joined by Dan Issel, David Thompson, Dikembe Mutombo, Byron Beck and Alex English. The former players and Moe had a private dinner Friday night, which Malone attended. Kings: Wrap up their three-game trip at Phoenix on Monday night. Nuggets: Host the Washington Wizards on Monday night.